In this article, I am going write C# code to Read and Write Registry Key and Registry Value, C# code to Read Registry Key from Remote machine or Remote computer and Read Registry Value using WMI in Local and Remote machine. You can create Registry Key and write Registry Value in C# by using built-in C# function RegistryKey. 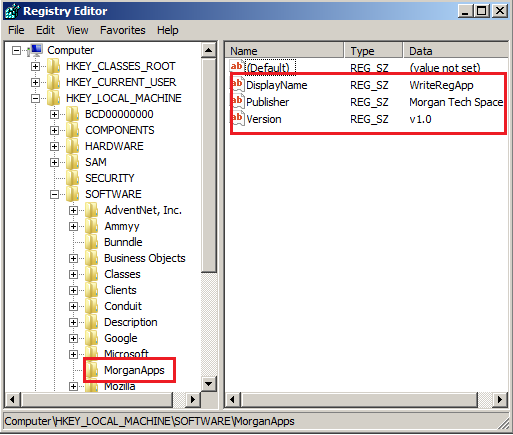 Here, I have written simple function to create registry sub key 'MorganApps' and write registry values in this sub key. You can read Registry Value and Key from Remote Machine in C# by using following function. You can read Registry Value and Key in C# by using WMI class StdRegProv instead of using .NET class RegistryKey. You can use below C# function to get list of installed programs in Remote Machine by reading Registry Value via WMI in C#.